One final post before I leave town. I hope to return someday relatively soon, where I can do some proper sight-seeing, share the experience with someone, and get out to the fjords for an adventure or two. Last night, I wandered through the Palace Park after dinner. It’s a beautiful park just outside the Royal Palace (the king was in residence while I was here, but I did not run into him anywhere 🙂 ). The park is so beautiful, with many gardens, statues, ponds, and fountains. I spent quite a bit of time enjoying the weather and taking in the beautiful spring flowers. The below is the view from the Royal Palace back along the walkway. It’s hard to tell (I am no photographer), but the walk is lined with hundreds of lilac bushes. Oh, the smell is so wonderful! 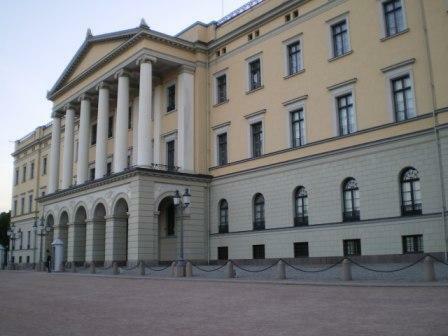 This is the Royal Palace. The drive is a thick gravel. I expected lush gardens, but it’s this huge gravel drive. This is all right in the city center, a few hundred feet from the National Theatre where my first night’s pictures were taken. 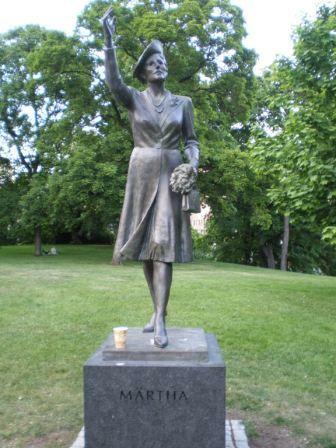 My personal favorite of the statues in the Palace Park. She doesn’t look much like my Martha, but it still made me smile. This morning I woke up really early to catch a few more sights in town. 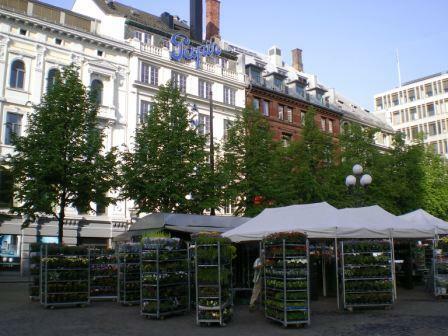 I liked this plaza-turned-into-a-plant-market. They had huge trucks of geraniums, herbs, peonies, hydrangeas, evergreen trees, and on and on that they were unloading to sell in the city center for the day. I ventured next to the Opera House. 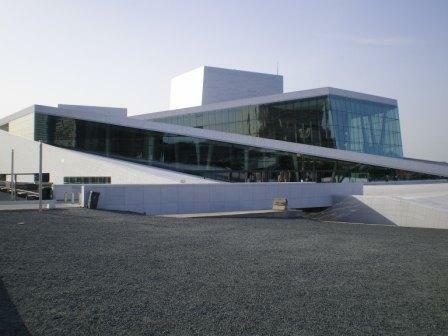 The sloped roof is all marble and you can walk up the roof to get a little higher and see a broader view of Oslo. This is a fortress you can see from many places in the city, this view is from the Opera House. I wish I had time to go up there and see some of the history. Another direction out from the roof to a peninsula. 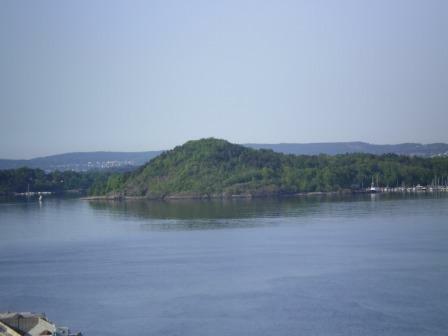 There are rock islands covered with beautiful green trees everywhere. I couldn’t find a spot to get high enough and take a picture. It reminds me a bit of the San Juan Islands. 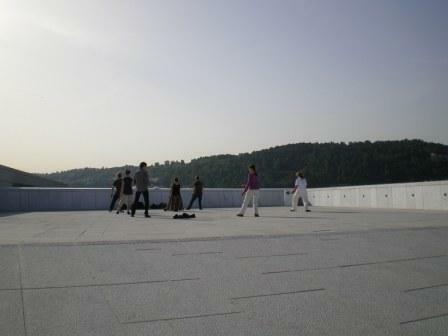 A group of people practicing Tai Chi in the warm sunshine on top of the Opera House roof before heading into work for the day. That’s a nice way to break up the commute! 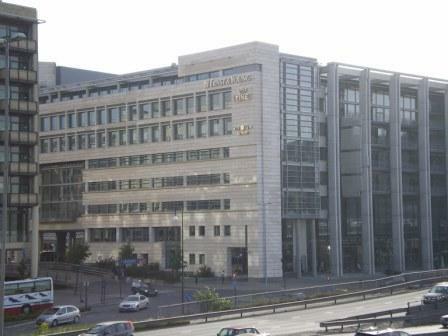 I laugh, it seems everywhere I travel I run into an E&Y building. S and I always get a giggle out of it. I think it might be a quick humbling reminder as to how I’m able to travel to these wonderful places. I had to do some extreme zooming and cropping for you to see this. But I made a fatal error on the 2nd night of my trip and didn’t have my camera when I went up into the mountains. I’m hoping a colleague will send his photos soon. 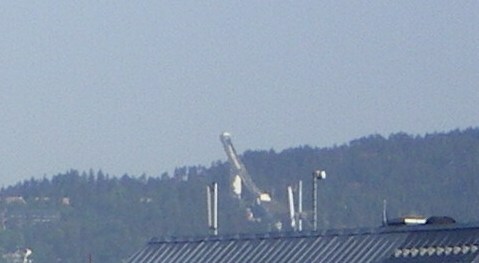 This picture below is of a ski jump that is about 20 miles from where I was standing when I took this picture. I have a cheesy little camera with minimal zooming skills, this is not a small ski jump. It was so steep! If I get the pictures of the mountains I will certainly share, the views of the city were amazing! And…chips. Where are my royalties? 1. In every hallway in most hotels, there is a shoeshine. You know, the machine you turn on to buff your shoes. Too bad I only have tennies and suede wedges. I’d so shine my shoes while waiting for the lift. 2. The food is really good. Lots of fish, prepared in a zillion ways, and I even had crawfish for lunch today. It was absolutely delicious! Oh. And does it get better than a giant spread of cheese with every meal? 3. The “green” roofs everywhere. Many people up in the mountains plant grass on their roofs. This technique, if done correctly, will not rot the roof and helps to insulate the home. It looks nice too! They must go up to the roof once a year to pull the tree sprouts though, because if they take root, you could have a tree in your bedroom, bathroom, or even your living room ceiling! 4. The funny paintings they have on the stall doors in restrooms. I got one with my cell phone tonight, I hope to transfer it and share when I get back to the states. 5. As we near the $5 mark for a gallon of gas, remember that it could be worse. It is near $9 per gallon at the station up the street (where it cost me $12US to get a 1.5L bottle of water and some Haribo sour peach candy…yeah, I’m a total Haribo addict). 6. The people are so gracious. I’ve really enjoyed talking with many of them (yes, they have to speak English, though I’ve picked up a few Norwegian phrases). Their passion for life is exciting. Many of them ride their bikes to work (some up to 30 miles round trip). On the subway tonight, there were four guys who loaded up their mountain bikes and got up to the top of the mountain. They rode down these amazing trails. Everyone takes advantage of the long daylight hours (reminiscent of our Alaskan buddies) and pushes life to the max during the summer. Hello everyone! After one really long flight, a few delays, and one missed connection I am in Oslo, Norway! I’m a tad discombobulated, but have been able to spend a few hours in central Oslo, trying to understand the culture (and that painfully non-Latin based language). My flight out of Seattle was 2 hours delayed and I had a 50 minute connection to make in Copenhagen, Denmark. You sort of lose all sense of time, day of the week, language, medicine when on a trans-atlantic flight…especially in the summer months. It was light outside (and breathtaking) the entire trip to Europe, as we come close to going over the North Pole to get here from Seattle. Upon my arrival in Copenhagen, there was no one to talk to! What do I do? I missed my connection. So….I wandered through a security checkpoint (re-consolidating your 3oz in 1qt bag or 100ml in a 1L bag liquids after a 10 hour flight is a PAIN)! Fortunately after passport control (yay for a Denmark stamp on the passport), I passed through another security checkpoint and found a SAS counter where I could get a boarding pass for my flight that apparently left in 25 minutes(!). I ran through the airport, found my gate and made my way to Oslo, without much trouble, though I *thought* for two seconds that I wanted to stop and shop at all of the beautiful glassware stores. Sigh, maybe on the way back. Tulips, a fountain, and cute kid statues in the pool. Several statues of actors along a beautifully designed pansy garden. In the far background you can see where I had dinner (just near the gazebo). A really great fountain. Sigh, I miss my photographer and his camera. A neat little walkway. The weather is PERFECT for an evening stroll. It was about 75° and no clouds today. We decided at the last minute to hop a ferry to Bainbridge Islandlast night for dinner. Bainbridge is technically one of the San Juan Islands, but is about a 30 minute ride from Downtown Seattle, a quaint little island town, and boasts some beautiful views of the Puget Sound as well as Seattle. We ended up eating at San Carlos, a little mexican restaurant. When we sat down on the back patio, we noticed some familiar music playing in the background. Robert Earl Keen is apparently well loved by the staff at San Carlos. It brought us back a little bit, we reminisced about Texas, and then realized it would be too hot to sit on a porch eating dinner in Texas tonight, so brought ourselves right back to Washington. And I Officially Pronounce it…Summer! We got our veggie garden together yesterday! Scott spent quite a bit of time over the last few months building a raised bed for our herb and veggie garden. Yesterday we finally filled it with dirt and delicious dinners to be. 1 1/5 cubic yards of dirt/compost mix. Planting! As you can tell, it’s late afternoon as the bed is moving into the shade. It is the sunniest part of our back yard though, from about 6am until 5pm it has sun. All done! 3 tomatoes, 1 brussel sprout, 2 beets, bibb lettuce (we’ll progressively plant that so we can harvest thru the summer), cilantro, scotch bonnets, serrano peppers, jalapeno peppers, and 3 basil plants! I’m interested to see how the hot peppers fare, it may not be warm enough in Seattle to make that happen, but it’s totally worth the try! Summer has definitely hit Seattle (for the weekend)! It was in the 80s for the last three days, the house is nice and toasty, the lawn mowers are a-buzzing. We’ve been down with a nasty cold in this house, so we didn’t get to enjoy too much of the good weather. We started feeling more human today and did a bang up job enjoying the weather. Scott spent the whole day outside dealing with the jungle that has become our yard after 3 consecutive weekends away. I did a deep clean of the house. We rewarded ourselves with a dinner on the grill tonight. Scott chopped up two serrano peppers and mixed it with the hamburger meat and grilled ’em up. We also had some grilled white corn, YUM! I baked some thin slices of red potato seasoned with a bit of olive oil, cayenne pepper, garlic salt, and thyme (oops and a little hot curry powder slipped in there). Alaskan Summer Ale has hit the shelves, so we had one of those too. Great Sunday night dinner. Hope all of you are ready for the upcoming week! Last week, we had the honor of most (a couple were missing) of our friends and their mothers getting together to celebrate a new life! Allison is having a sweet baby boy very soon, so the old friends from pre-school, grade school, high school, college, medical school, life…. got together to honor our sweet friend. The friends…Pam, this inspired me from your post about your highschool friends, girls, no matter how far away we live from each other, we can get together and feel like no time has passed. The beautiful mom-to-be. Love you, Karmonocky. *all photos compliments of Jennifer H.